We’ve all heard plenty of advice about negotiating. The business world directs us to stay rationally focused, rely on exhaustive preparation, think through alternatives, spend less time talking and more time listening and asking questions, and let the other side make the first offer. The psych world counsels us to listen first, sit down, find common ground, move in, keep cool, be brief, forget neutrality, avoid empty threats, and don’t yield. These tips don’t have much meaning without knowing the underlying principles of negotiations, and studying tips alone is about as meaningful as learning dance steps without ever hearing the music. The following three-part series presents the rhythm of negotiations as described in the Harvard Negotiation Project’s Getting to Yes: Negotiating Agreement Without Giving In. It should be useful for those first learning to hear this rhythm and for those who have been dancing since the bazaars of their youth who may need to go back to basics to learn some tricky new steps. 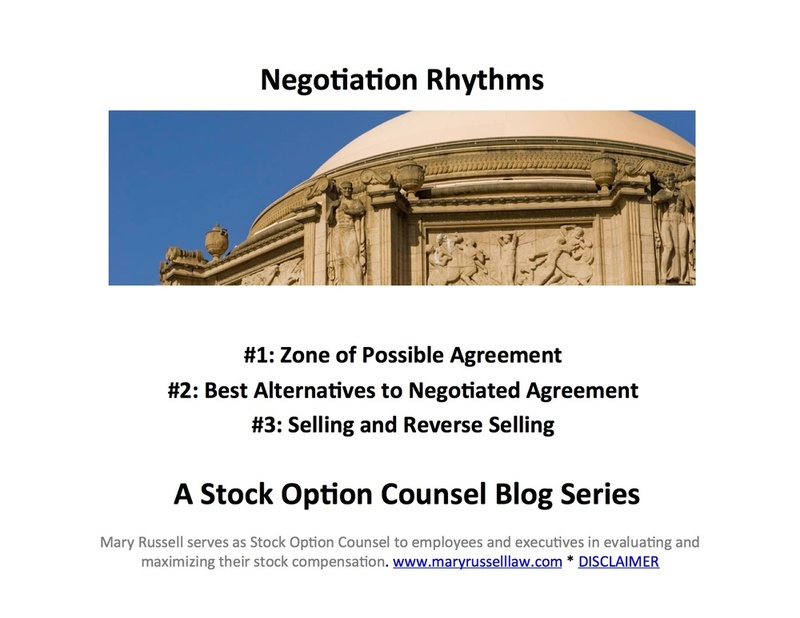 Mary Russell counsels individual employees and founders to negotiate, maximize and monetize their stock options and other startup stock. She is an attorney and the founder of Stock Option Counsel. You are welcome to contact Stock Option Counsel at info@stockoptioncounsel or (650) 326-3412. Roger Fisher, William Ury and Bruce Patton, Getting to Yes: Negotiating Agreement Without Giving In.